The GLYTONE product line was developed to provide the highest skin rejuvenation efficacy and targeted skincare solutions for skin health, using the highest free glycolic acid levels available. Part of the Pierre Fabre Group, the company's research centers are dedicated to scientific advancement in Dermo-Cosmetics and Aesthetic Dermatology as well as other medical fields. 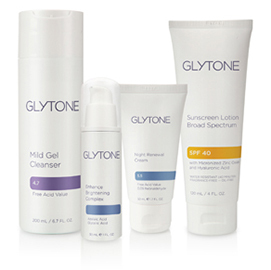 GLYTONE products incorporate clinically proven ingredients that address specific skin concerns including: aging skin, acne, dry/rough skin, hyperpigmentation, sun protection, redness relief, and post-procedure. With products that deliver the highest levels of free glycolic acid, each GLYTONE formulation exfoliates, renews and hydrates, allowing your skin to take on a brighter, clearer and more youthful appearance.